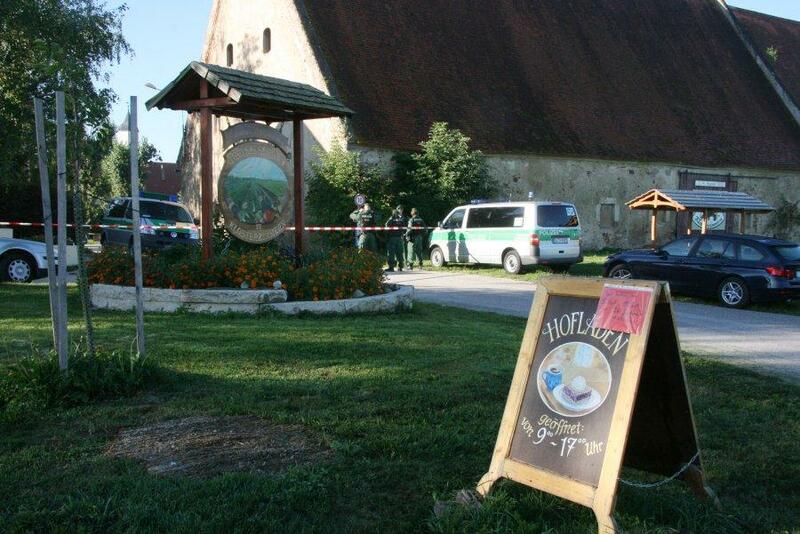 The police raid foray-type at 6 am taking the children from the parents of the biblical community 12 Tribes in Klosterzimmern (Nördlingen) and Wörnitz (Ansbach) – because of the “muckraker” report by an RTL reporter and statements of an “ex-member” of the group – already took place on Sept. 5th, 2013. Photo by Dieter Mack, Augsberger Allgemeine. Since then, both children and parents have cried many tears over the separation, they have written heartbreaking letters of request (even just for a single visit during a festival at home, which was NOT granted! ), they have fought desperately, and experienced painful separations following the brief and infrequent visits (about 2 hours every 3 weeks). My friend whose 9-year-old son has been having to live first in an institution and now in a remote host family since Sept. 5th, 2013, let me know a while back how the witnesses she put forth were “not accepted.” How can this be in a (supposedly) just and fair trial? I have visited the Community in Klosterzimmern 2 times and found them to be a wonderful community! They work together creating something I had never experienced before – life with and in nature, harmonious, healthy, with animals, plants, the other human beings. The large monastery property of Klosterzimmern was wonderfully restored, expanded, and revived! Germany needs people who fashion the old into the new, who live with nature without exploiting it, who live in COMMUNITY, who are there for each other, helping each other! Who live along with their children – who experience and carry further this security from the beginning of their lives. These believing people would never beat their children so as to injure them! They love their children just as all other parents do. To bear the current forced separation is so difficult. Is this tolerable in a “free state under the rule of law”? Aren’t there some problems of an entirely different dimension in Germany – children who really are in danger, troubles wherever you look? Why do you tear these very children and parents apart at all costs? You could scarcely imagine any more loving and more insistent letters of request than those written by these children. Please support the speedy reunification of the affected parents and children in Klosterzimmern and Wörnitz! Please finally let these religious people mold their lives self-determinedly again in peace, freedom, and responsibility! Note: This letter will also go to the press and some public figures. It is an expression of genuine concern. Are these parents being treated with HARSHNESS deliberately because of their Christian faith? Where is the FREEDOM of molding your own life or belief in that? “I do not want to be misunderstood as someone promoting beating children but the article about the children of “Twelve Tribes” did shock me. The justice refers to the law of “banning violence from child rearing” and the right of the child to a “violent-free child rearing”. Obviously for the justice it is a “violent-free” measure to destroy families. This is a pretty perverse interpretation of the term “violence”. The parents must now live without their children, according to the article. “Worse still is that the children now have to live without their parents. For children it is probably the greatest catastrophe of their life and a traumatization that they will probably never get rid off anymore. And that for reasons of “the child’s welfare”. Unbelievable. The first child of a young couple, a one-and-a-half year old boy, was taken almost two years ago from his parents even though there was no indication at all that they ever disciplined him. The court withdrew custody from the parents permanently only based on their religious conviction! Two twin girls cannot live anymore with their parents even though also with them there was no indication of an endangerment. There are only apprehensions that the parents will discipline them in the future because they believe in the Bible. Since almost two years the children wish to return back to their parents. Both set of parents have sent in the meanwhile complaints at the Federal Constitutional Court in Karlsruhe and hope for a favorable decision.